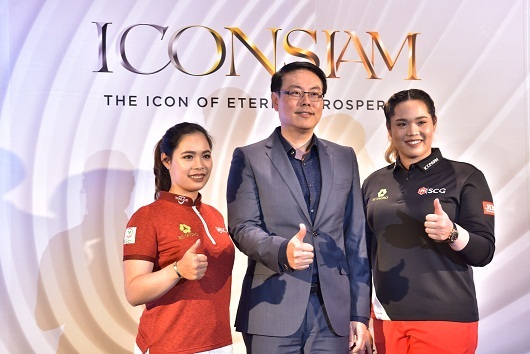 ICONSIAM, the mega city project of future living and the icon of Thailand’s prosperity on the Chao Phraya River, held a press conference to welcome and glorify Pro May – Ariya Jutanugarn, the world’s No. 1 golfer, and Pro Mo – Moriya Jutanugarn, the champion of Hugel-JTBC LA Open 2018, after the two sisters had marked special reputation to Thailand from the world-class golf tournaments. 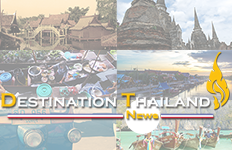 Mr. Supoj Chaiwatsirikul, Managing Director, ICONSIAM Co., Ltd., said, “ICONSIAM is vigorously determined to admire the precious stories and pride from every single aspect of Thainess. We shall portray the stories about the competence of Thai people whose successes are regarded as benefits and milestones to the country via the concept of YOU ARE THE ICON. The different legends shall be the representatives of the era to tell and promote the stories concerning Thainess to Thai people and to the world. 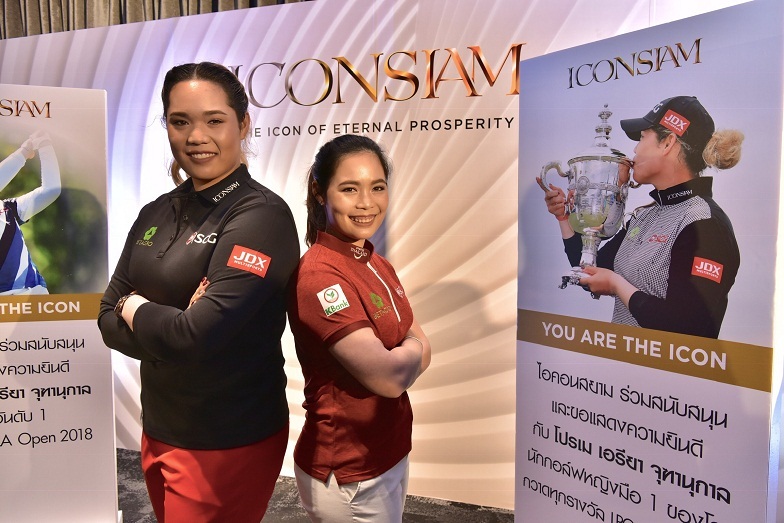 The two sisters from Jutanugarn family are Thai professional golfers that have successfully set their milestones, as well as Thailand, to the world recognition”. Pro May – Ariya, the world’s No. 1 female golfer, is regarded as the first golfer in history that has grabbed all prizes of LPGA Tour in 2018, i.e. Race to the CME Globe ($1 million bonus), 2018 player of the year award for the 2nd time (2016, 2018), the biggest prize in a year of over $2,700,000 (90 million baht), the best average score of 69.415, the best performance in majors (US Open, ANA Inspiration, British Women’s Open), and the highest number of top-10 finishes, 17 out of 28 events (championship in 3 events). Meanwhile, Pro Mo – Moriya won the first championship last April from Hugel-JTBC LA Open 2018 at Wilshire Country Club, Los Angeles, California, USA. “Both Pro May and Pro Mo are considered YOU ARE THE ICON, or the role model of Thai people. Throughout the time of their tournaments, the sisters showcased their competence and resolute determination, both physically and mentally, to the competition. In addition, both of them have received morale support and encouragement from all of the Thai people and, in turn, the tournaments have brought both happiness and pride to Thai sports fans. Other countries, as a consequence, have finally realized the talents of Thai sportspersons who are second to none in the world. To promote the concept of YOU ARE THE ICON in Thailand, ICONSIAM is very pleased to announce that ICONSIAM has appointed Pro May and Pro Mo to be ICONSIAM’s Brand Ambassadors since both of them have initiated great inspiration to the country and the two are qualified to the ICONSIAM’s commitment, which is to glorify Thai people with great competence. The two sisters shall promote while making ICONSIAM and Thailand well recognized through their reputation, their hard work, and their contribution, from now on up until the next year”, said Mr. Supoj.